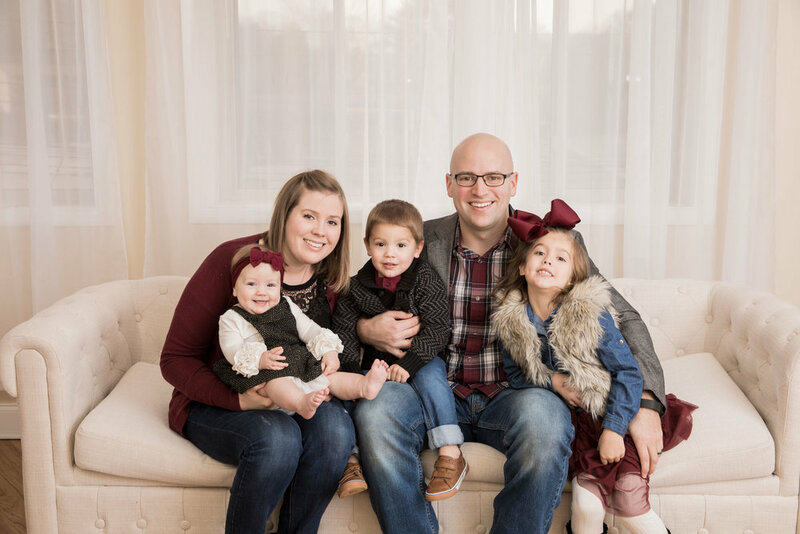 Meet the Whittemore family ( almost everyone, a sweet new addition has arrived since their maternity session)! 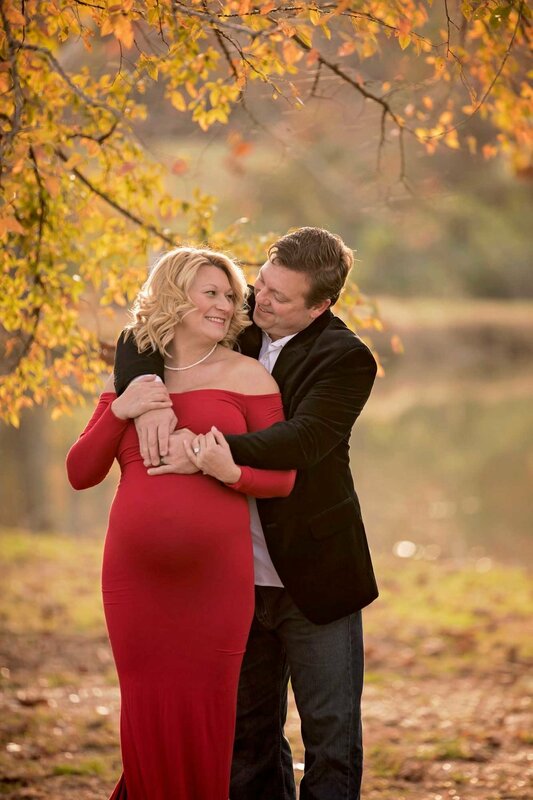 Heather contacted me for an awesome family maternity session and we made it happen at The Cove at Concord Park. During family maternity sessions, I love to do a great mix of poses with just Mom, the family, Mom and Dad, and some solo of the kiddos. It allows us to have the focus on maternity pictures, but also show the relationships, and have a great variety of images. These guys were amazing; we did so many beautiful poses in just 45 minutes. Little Louis was a total trooper to give his Mom some amazing mother-son pictures even after he thought his portion was done. 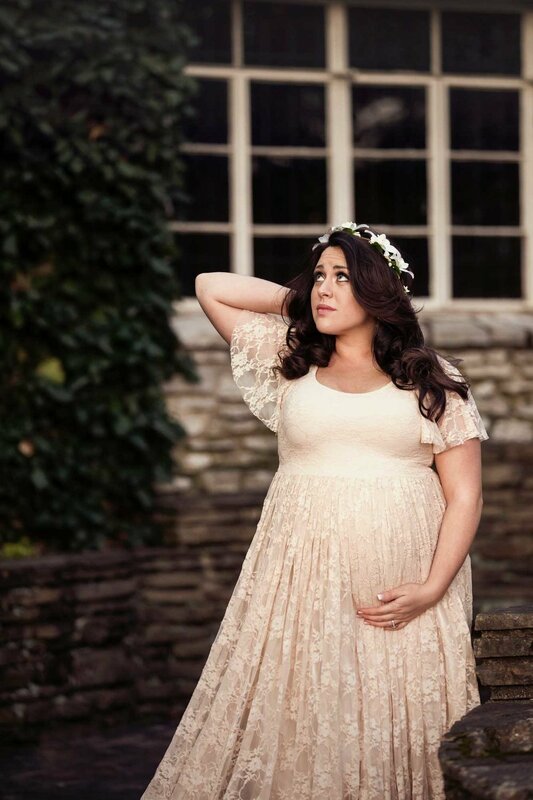 The Carringers Knoxville maternity session could not have turned out more perfectly! Simply put, the rsults are awesome! 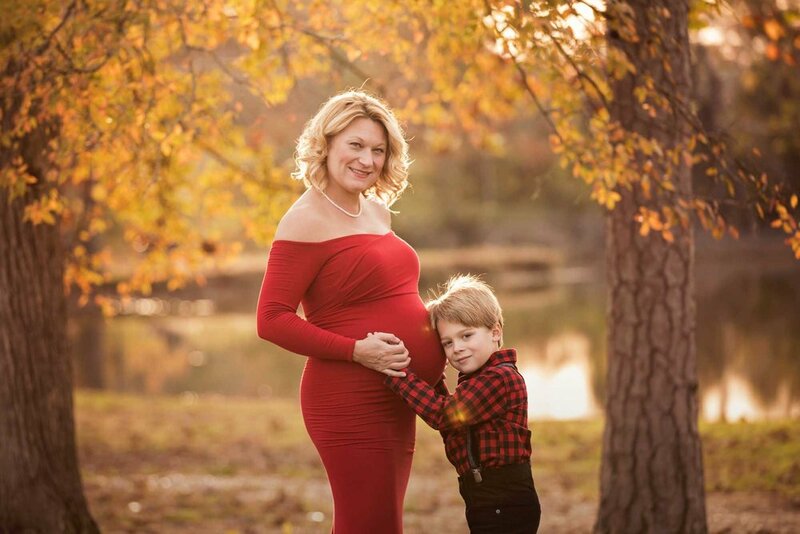 Kent contacted me back around the holidays, to purchase a maternity and newborn session for his wife for Christmas. I have to give him kudos for thinking of portraits as a gift; so thoughtful. Everyone was a bit concerned about the weather and foliage for the session with the up and down weather we've been having here in East Tennessee over the past few weeks. The day of was BEAUTIFUL, warm for early March, and a few of the trees and bushes were already in bloom. Kent and Jessica were awesome and had some great input for backdrops that I was able to incorporate with my own. I can't wait to meet their new addition next month! This beautiful Mama's name is Emily and she had her heart set on a maternity session with a Smoky Mountain backdrop. Coming from Knoxville, we wanted to choose an easy access location, so this little nook was perfect, and the mountains are stunning!! I couldn't have asked for a more beautiful day! These puffy clouds rolled in just before sunset, making an amazing sky, and Emily looked so gorgeous with the mountains behind her. Maternity sessions are always magical <3. Capturing this time of excitement and beauty is one of the very best parts of my job. Gatlinburg family photography sessions in the winter come with their own unique set of challenges. This good-looking family was visiting from Florida this month, and was hoping to see snow on the Gatlinburg vacation. To say it simply, they got their wish; a winter wonderland! The downside of snow in Gatlinburg is the road closures ( and super chilly temperatures!). This sweet family was amazing and totally flexible to change their date due to the weather. We were all set to go to Cades Cove, and thought we lucked out, because the loop re-opened on the afternoon of our re-scheduled session. Unfortunately, we didn't think to check and see if other roads they needed to travel on the way were also open. Thank goodness, they thought quickly and contacted me to let me know they couldn't get there, and we were able to move their session to a location in Knoxville with well-salted roads. While it wasn't the Smoky Mountain views we were all hoping for, I'm so glad we were able to capture their family while they were all together. In the end, that's all that matters. There was still a bit of snow on the ground, and freezing cold, but they braved it out! Here's the highlights from their Pigeon Forge family reunion session. Beth contacted me several months back to photograph their family while they were visiting Gatlinburg TN on vacation. We chatted, booked, and thought we had everything all set. Well, if you've ever been around the military, you know plans are made to be changed, and since one of the members of their family is a service member, we needed to move our session to accommodate their schedule. No problem, once again, we're all set. Now, we have had one of the coldest winters I can remember this year, and of course, their session was set to fall on one of the super-cold, 23 degree days we've had recently. The cold coupled with little ones recovering from the flu forced us to get creative and move their session from Cades Cove to my Knoxville studio. They hung in there through all these changes though, and I'm so glad they did! The images were not what we had planned, but I love them just as much! The studio lent a very classic feel to this extended family's portraits. Say hello to baby Reed! He's such a cute little fella!! This sweet baby is just so loved; I'm incredibly glad I was able to be apart of his parent's journey to parenthood. It's not every day I get to see a picture of one of my newborns as a teeny, tiny embryo. His Mama had this beautiful watercolor done from an ultrasound of him as an embryo that we used in their pregnancy announcement; it's probably one of the coolest things I've gotten to photograph. Oh happy day! It's always a great day when I get to cuddle a brand new baby! The Quillins sweet, sweet baby girl was a delight. She was an AMAZING sleeper and flew through her newborn session. Her big sister was such a sweetie! She was the perfect role model for her baby sister during the session, she even held open the studio door for me when my hands were full. This little bit was the first baby to use my news Carriage! I love this piece! It's perfect for your little princesses first photo shoot! She can ride in style for those sweet pictures. What little girl doesn't want to be a princess at some point in their lives? Next, the sisters got to be in the spotlight together! Little bit's big sister could not stop kissing her; it was the sweetest thing. You can tell they'll have a wonderful childhood toegther. Hi guys! As I've told a few of you, our family puts on a huge synchronized light show for Christmas. This year, we've tripled our lights, and have a total of just over 45,000 total bulbs that all twinkle and dance to music. This is just a fun thing we like to put on for the local community and I'd love to see you guys out here. The address is 924 Montgomery Lane in Maryville. To view the show, it's best to park at Montgomery Ridge Intermediate School and walk down to view the show from the sidewalk. Show will run at 6pm, 6:30pm, 7pm, 7:30pm, 8pm, and 8:30pm nightly until December 22nd- 25th when the last show will be 10:30pm. We have a radio playing in the yard, but to hear better, we recommend bringing a portable FM radio and tuning in to 92.5fm. A few weeks back, the beautiful Pfeffer family visited Gatlinburg on vacation from Nashville and requested a Smoky Mountain family session. We opted to use Metcalf Bottoms as our location for its wooded look, super easy river access, and relatively short drive from Pigeon Forge. I love how versatile it can be with woods, wildflowers, and water. Their two sweet little girls were troopers! Our mountain session was awfully close to bedtime, but they did great and gave some shy smiles. Vacation pictures can be awfully hard on little ones, whose schedule is thrown for a loop, but with a little patience, we always get awesome pictures. We started out by the water, for some beautiful mountain stream pictures! The water stays SUPER cold, so we didn't venture into the stream, but enjoyed the soft babbling in the background. Next, I led their family down the trail just a bit, to an opening in the trees. I find the woods so peaceful and love when families want a picture there. The greens in the summer forest and just gorgoues! The Pfeffers ended their session in a patch of wild clover, playing with their beautiful girls. Tickles and giggles are a huge part of my family session with little ones and they are alwasy some of my very favorite images. It's that time! Time to think about your fall family photos and Christmas card images here in Knoxville. I'm hearing that the foliage should be AMAZING this year, way better than the past two or three Autumns. I'm SO excited; fall is my very favorite season. Seriously, please don't wait! I'm even a bit late writing this. October and November for photographers has been compared to April for an accountant. Those two months are CRAZY busy here in Knoxville, and even more so for my Gatlinburg and Cades Cove sessions. My October/November weekends are sometimes booked 2-3 months in advance. I absolutely hate to turn people away, so I'll do everything in my power to make room for your session, but sooner or later, I run completely out of slots. So especially if you have a hectic schedule and need certain dates, book as early as you can. Your wardrobe can make or break your session, the feel and look of your images. You should absolutely use this to your advantage. Avoid too many large and crazy patterns and neon colors. A pattern or two mixed in is great for a bit of texture, but too many distract from your beautiful family. I love soft neutrals with a pop of color for family portraits. IF you need help, I'll be happy to point you in the right direction. Taking some time in the days leading up to your session to explain to your kids what to expect during the session and what you expect from them can work wonders. I find when littles are prepared, sessions go super smooth. I'm not above bribery with own kiddos, and find that going to the store and picking out a small toy ahead of time ( They're SUPER into blind Shopkin packs), that they can have if they're good listeners and patient during their photos, helps boost their morale a bit. Of course a good nap and a full belly before your session is also a great idea if you can swing it. I'll be the first to tell you, family pictures almost never go as planned. From the planning phase, to the actual session, little things go wrong and things aren't always perfect. We will work together to make your session just as amazing as possible, but if we hit a bump, roll with it. It's so easy to get stressed out when little ones running around when they're supposed to be posing for your stunning family portrait. I promise they're not the first, and you will come out with amazing images, even if we have to play three rounds of ring-around-the-rosie to bring out those smiles. Meet the beautiful Sheppick family! They recently welcomed a BEAUTIFUL baby girl that I had the joy of photographing. Little miss was such a sweet little nugget of baby goodness; I couldn't get enough of her! Snuggling teeny babies never gets old <3. During newborn sessions, I like to start with the family pictures, if requested. It keeps everyone looking fresh for their pictures, before enjoying the 75-80 degree room ( to keep baby toasty warm.). Aren't they the cutest little family? Sweet little miss was such a cooperative baby after she fell asleep. I got to use tons of set ups and had so much fun dressing her up in different outfits, wraps, and headbands. One of my favorites is the floral wreath! Meet the Shrewberry family! They invited me to come and take their pictures in their neighborhood, with the cutest little bridge. This little family of four did amazing, especially those sweet little boys! At their age, it's super hard to sit still and look at the camera for a bunch of family pictures, so we made sure to have some fun play-time mixed in. 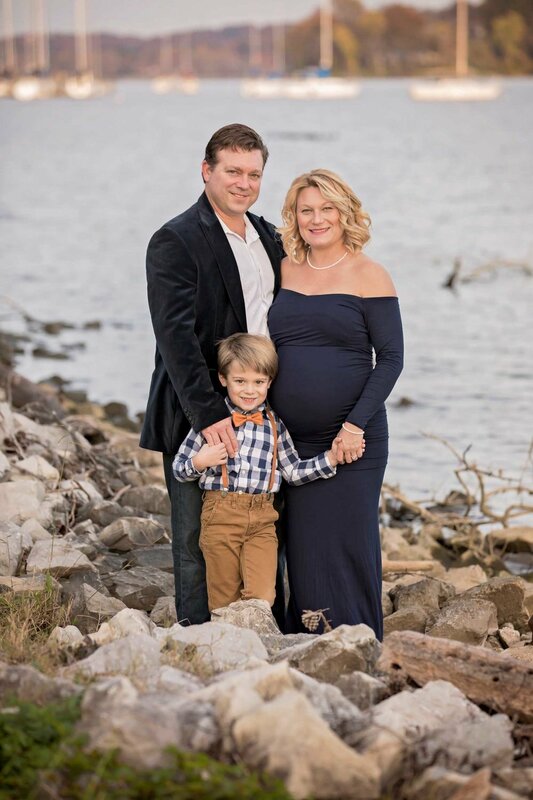 Running, swinging, and being tossed in the air does WONDERS for bored little ones to make sure you receive amazing Knoxville family pictures! A happy accident: that's exactly what Ashley's BEAUTIFUL Smoky Mountain maternity session was. This lovely lady had her heart set on beach maternity pictures while her little family was visiting Charleston, SC. Sadly, the weather had other plans and rained them out the entire week! She got in touch with me just as soon as she knew her original plans weren't going to be possible to get on my books. She had a vision of maternity pictures in the water, and it took some brainstorming on both of our parts to find the perfect location that would suit all of our needs. We settled on Cades Cove where we would have both a beautiful stream and the mountain views for her maternity session. Guess what happened on our first scheduled date? Rain! Of course it would rain us out on our first attempt. Thankfully, we pushed through, found a new date, and it was perfect for the session. It was cloudy the whole drive up, but the skies cleared just as we started. I LOVE water pictures and the day was perfect for them. A beautifully warm July afternoon, where the water was cool and soothing on our feet as we waded out to the middle of the stream. Ashley looks so radiant and serene in water. While it's no beach, I adore the beauty the Smoky Mountains have to offer. 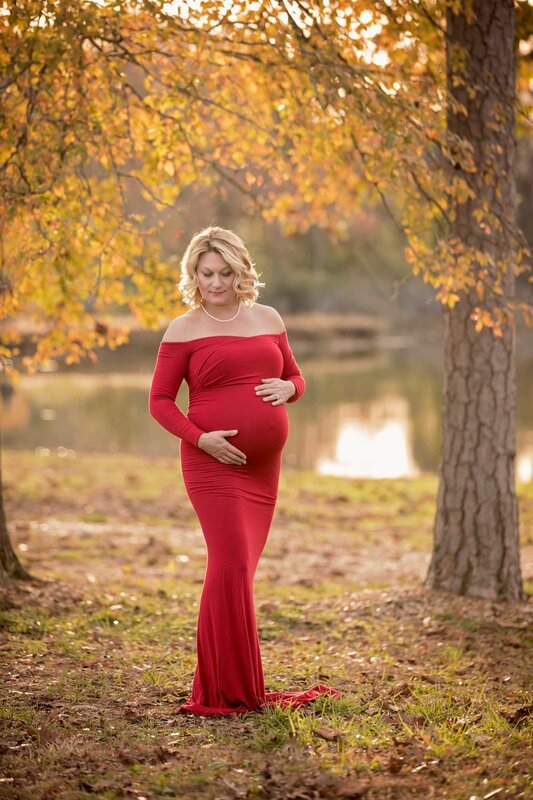 After the water, we headed out into the fields and road with Ashley in my Harlow maternity gown to take in that beautiful view! Cades Cove has amazing views in every direction, making it one of my very favorite spots. Tracy and her beautiful family invited me to come out to their cabin to photograph her extended family in celebration of her Mother and Father-in-law's 50th anniversary. We absolutely lucked out that their Gatlinburg cabin sat just 10 steps from a grassy spot with a stunning view of the Smoky Mountains AND we had just enough shade to make perfect portraits with them never leaving sight of their home away from home. Tracy' father-in-law was in poor health, so it made these pictures extra special, and also made it a must that we be able to stick close by the cabin. The beautiful family was perfect for pictures! Being surrounded by family during these big sessions tends to really keep the big grins on their faces. There's always an uncle or grandpa willing to be silly with me to grab the best smiles! Extended family pictures are so, so, so important! In the end family is everything, so let's celebrate them. This is one of my all-time favorite pictures! We asked all of their grandchildren to give them a big hug and it couldn't have turned out more perfectly! This was one of the very last pictures I took at their session, when this sweet girl scooped up some bright yellow wildflowers, I snapped the picture. It sums up this session perfectly: beautiful and peaceful. Meet the Sivestros! 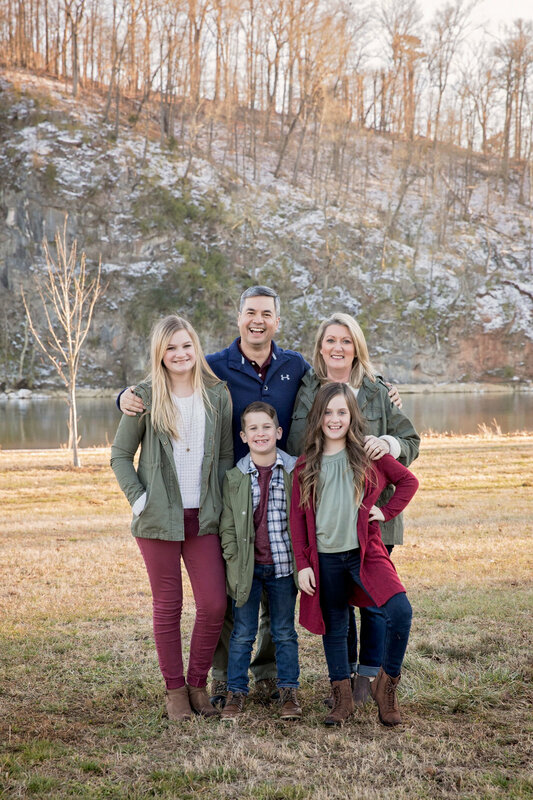 This spunky little family had the great idea to take their Smoky Mountain family pictures at The Island in Pigeon Forge during their vacation. I just love the fun-loving feeling this location lent to their images. If you're visiting the Pigeon Forge area, you should check it out! The Island is a cute little area with unique shopping, rides, and tasty, tasty food! It's a great way to spend the afternoon during your Smoky Mountain vacation with stuff to do for everyone. I need to make it back up there myself soon to check out the Paula Deen restraunt. It was a busy day at the Island, but we were able to make some great spots for family pictures! My personal favorite was probably the carousel; super cute! The fountains were a close second for a favorite spot! The way the water caught the light when it shot up, was just perfect for the background of their photos. So differnt and fun! It took a bit of patience, waiting for people to pass to grab some of this cute spots, but it was so worth it in the end.